Design engineers, product managers, marketing and customer service personnel. What is Failure Mode and Effects Analysis? Failure Mode and Effects Analysis (FMEA) techniques have been around for over 40 years. In recent years, use of FMEAs has gained popularity as a quality improvement tool. This interest is in large part due to the automotive industry and specifically its IAFT 16949 supplier requirements. Other major industries, including aerospace, medical products and electronics are also using FMEA techniques as part of their improvement and risk assessment strategies. Unlike many quality improvement tools, FMEAs do not require complicated statistics. FMEA studies can yield significant savings for a company as well as reduce the potential liability of a process or product that does not perform as promised. Failure Mode and Effectives Analysis (FMEA) training provides step-by-step instructions on how to conduct a Design-FMEAs (DFMEA). Learners completing this training will be able to effectively participate on an DFMEA team and make immediate contributions to quality and productivity improvement efforts. For how to do FMEAs in a non-manufacturing environment, see FMEA for Business Processes. Explain the purpose of conducting an FMEA. Explain the methodology of the FMEA process. Define the scope of a DFMEA. Work though each step of conducting a DFMEA. Use the FMEA Analysis Worksheet to document the results of the study. Customize the Severity, Occurrence and Detection Ranking Scales. Use the results of a DFMEA to trigger continuous improvement. 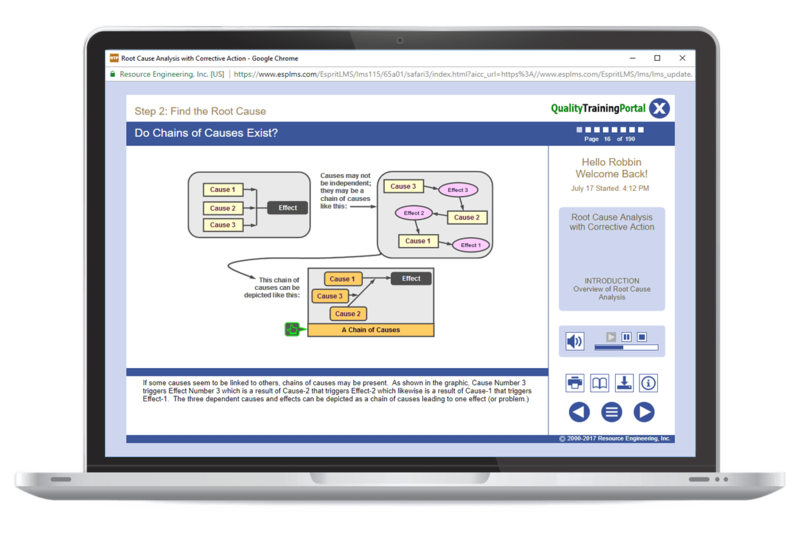 An understanding of data analysis tools and techniques such as Quality Improvement Fundamentals or the equivalent. 8D Problem-Solving – Step-by-step training in how to work on a problem-solving team follow the 8D methodology including tools and techniques that are used in each step. Root Cause Analysis with Corrective Action – Leads the learner through a four-step process to get to the root cause (source) of problems to eliminated problems for good. Lesson 1 | What is an FMEA? Know what an FMEA is and why an FMEA is used. Understand how an FMEA is conducted works on a conceptual basis. Understand how the systematic FMEA approach getting us to dig into the details of the product or process under study to identify potential risks. Realize how an FMEA helps identify risks, prioritizes the risks relative to one another and focuses efforts on an action plan to reduce the risks. Apply criteria to assemble and effective FMEA team. Understand the role of a Subject Matter Expert when conducting an FMEA study. How to define the scope of a DFMEA. How to break the study into two or more DFMEAs if the scope is too large. How to use a DFMEA Scope Worksheet to clarify and communicate the scope of the study. Step-by-step directions on conducting a DFMEA. Guidance on the use of the FMEA Analysis Worksheet. Techniques for customizing the Severity, Occurrence, and Detection Ranking Scales for a DFMEA. Tips on the best times in a product’s life cycle to conduct a DFMEA. Tips on how to use the results of an FMEA to trigger continuous improvement. An example of the application of a DFMEA, working through all 10 steps. Clarify the scope of a DFMEA. Work through the 10 steps of a DFMEA. Develop custom ranking scales for Severity, Occurrence, and Detection. Determine which technology tools to use as aids in your DFMEA action plan. Learn how to make the DFMEA into a living document. Use the DFMEA establish the basis for a Control Plan. Tips on the best times in a product's life cycle to conduct a DFMEA.